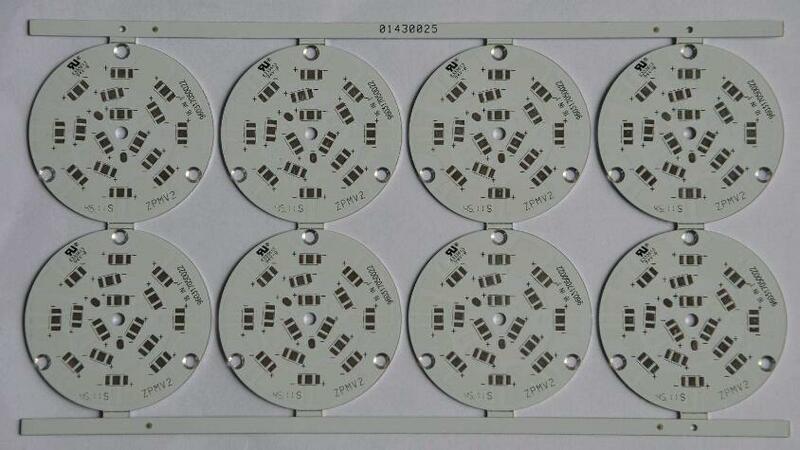 Power Converter and LED companies are by far the largest users of aluminum PCB. However, automotive and radio frequency (RF) companies also make use of this type of printed circuit board. Single-layer construction is popular because it is simple, but there are other configurations available. Flexible Aluminum printed circuit board. Flexible dielectrics are a recent development in Insulated Metal Substrate (IMS) Aluminium PCB materials. The materials feature polyimide resin and ceramic fillers, and provide superior electrical insulation, flexibility, and thermal conductivity. When used with flexible aluminum materials (such as 5754), the PCB can be shaped and angled to eliminate costly items such as fixtures, cables and connectors. Beware, though: the materials are flexible but designed to bend and stay in place permanently. They’re not meant for applications that require the materials to flex regularly. Through-Hole Aluminum. In highly complex constructions, a single layer of aluminum can form the central core of a multilayered thermal construction. With this type of PCB, the aluminum is pre-drilled and the hole is back-filled with dielectric before the lamination process. Next, thermal materials (or sub-assemblies) are laminated to both sides of the aluminum with thermal bonding materials. After lamination, the assembly is thru-drilled in a manner similar to a multilayer PCB, and the plated through-holes are then passed through the clearances in the aluminum to provide electrical insulation.